The approved version of the US-NRA is designated as version 4-0. This compares with “final draft” that was released as version 3-1 back in February. MixedWood has scanned the details of these two documents and has found a number of differences. The substance of these changes, however, appear to be minor. The NRA is very long and difficult to read. The main document is 180 pages, and an accompanying set of Annexes is 123 pages. MixedWood staff plan to examine and interpret the whole package in the next few weeks, and use what we learn to update the “User’s Guide” we prepared to help interpret the first draft in January 2018. For those who can’t wait, here are some high level observations and initial conclusions we can share now. Low Risk places – The Northeast, Lakes states, and the Southwest. 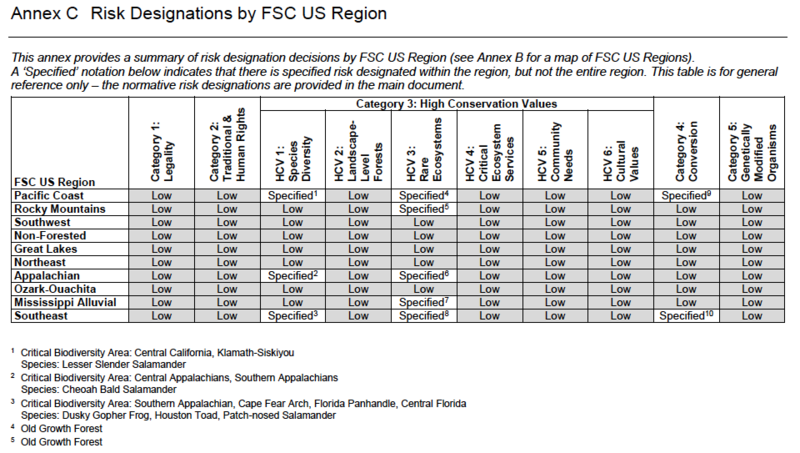 Specified Risk places – The West, Appalachians, and the Southeast. If you live and source wood from one of the Low Risk places, your work is largely done. The US-NRA includes no requirements for mitigation of risk, so wood sourcing can proceed without interruption. Better still, the need to maintain and constantly update a Company Risk Assessment (CRA) is finally over. A big improvement. If you live and source wood in the Specified Risk places, there is a bit more to do. Things are still better than before, but there are some additional chores to be taken care of. Sensitive Habitats – the places where rare and fragile natural communities may be at risk. 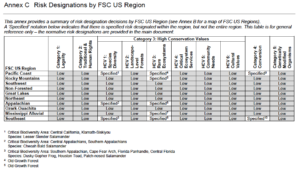 From the first moment that we laid eyes on the latest version of the FSC Controlled Wood standard, we identified “Control Measures” as the subject to watch. When a National Risk Assessment fails to provide a Low Risk conclusion, it is required to designates some mechanism to “mitigate” the identified (i.e. specified) risk. The mitigation mechanisms are called Control Measures. In addition to assessing risk, the NRA define a new set of requirements that apply to companies who source wood from the specified risk places. FSC-US took a unique and unusual approach to defining the mandatory Control Measures in its NRA. Rather than define actions that a wood sourcing company might take individually, they designed a process for broad-based, community action. A series of meetings were convened in the summer of 2018 to discuss and debate the topics. The output of those meetings was then summarized and synthesized into a series of implementable actions that CW companies will be required to do. They are documented in three packages: one each for meetings in the Appalachians, the Southeast, and the West. As with everything FSC does, the details are daunting at first glance. The results, though, appear rather inconsequential. It appears that most CW companies will end up with an obligation to distribute and promote educational materials aimed at encouraging conservation. In order to make all of this fly, FSC-US has to “sell” their approach to FSC-International. That negotiation process appears to have occupied staff from both arms of the organization much of the last several months. Their agreement – the Grand Bargain – can be seen in Advice Note 24 that FSC released simultaneously with the US-NRA. It’s quite a document and worth reading carefully. ADVICE-40-005-24 makes the case for the “innovation” of addressing conservation priorities at a landscape level. It explains why risk designation, mitigation, and verification should all be considered broadly, and the benefits that will be achieved. Importantly, it relieves Certification Bodies (CB’s) of the obligation to verify the effectiveness of the implemented control measures. In lieu of independent verification, FSC-US will self-verify the effectiveness of its own mitigation mechanisms. An odd choice, to say the least. The FSC-US Board of Directors released this letter on the same day we publish. They clearly acknowledge the unique features of the new NRA and the challenges its implementation will bring. This Grand Bargain is a fascinating topic that deserves its own exploration in detail. We promise to do that here before long. 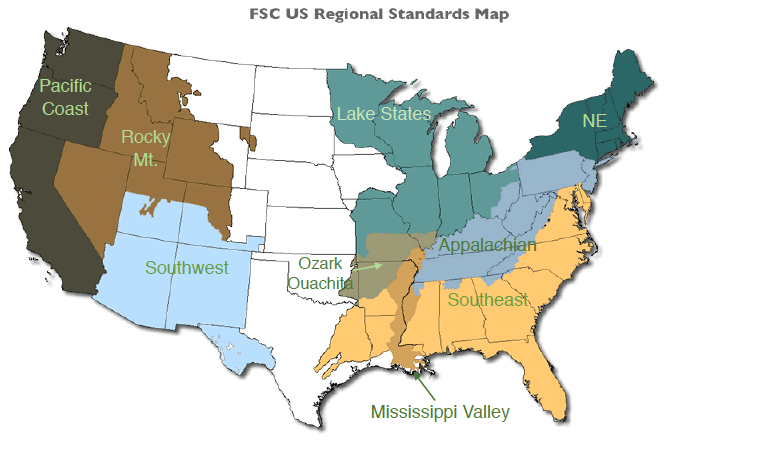 In general, we like FSC-US’s approach to landscape-level mitigation efforts. We are unsure whether their ideas are truly innovative or original though. A quick glance at the Sustainable Forestry Initiative‘s (SFI) Fiber Sourcing Standard (clause 7.1.2 for example) suggests otherwise. 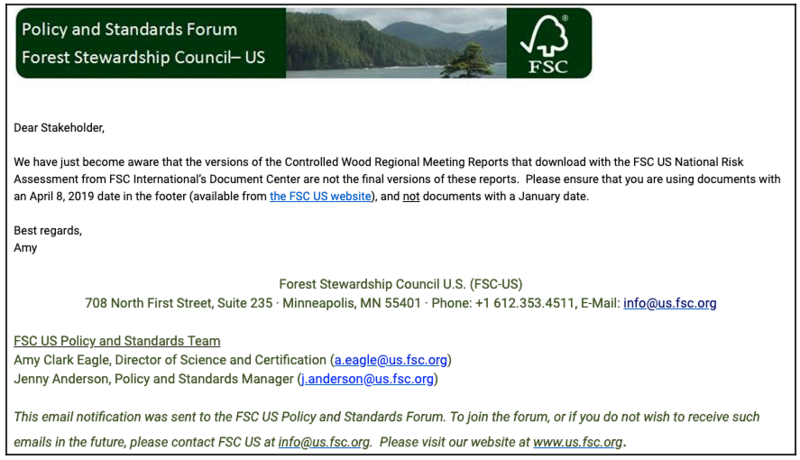 Apparently FSC-US and FSC-IC had some versioning problems when they released their approved documents. If you are among the folks who are examining and processing this stuff, please take a close look at this letter (received today). 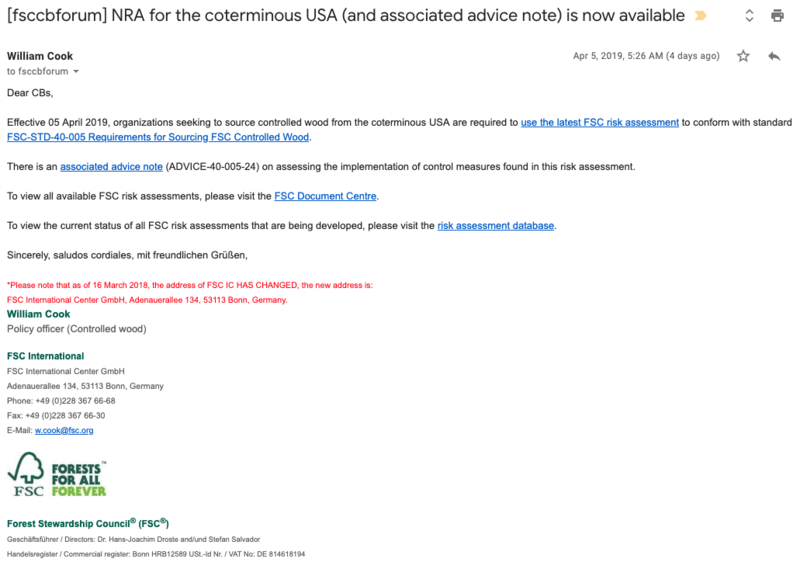 It appears that the definitive details on NRA Control Measures are found on the FSC-US website, NOT the FSC-IC document catalog.